So, what could I glean from these? Well, judging by the price and the fact that none of the components have gates attached it was possible that this would turn out to be a recast and not an original Forgeworld product. Upon inspection of the build instructions (sourced somewhere online) I could also tell that a couple of components were missing but I figured that I could replace them with some parts from my bits box. I could also tell that part of it had been assembled with questionable skill and that the remaining components looked to be in good shape. In the end, I resolved to bid on it but not to go too high. 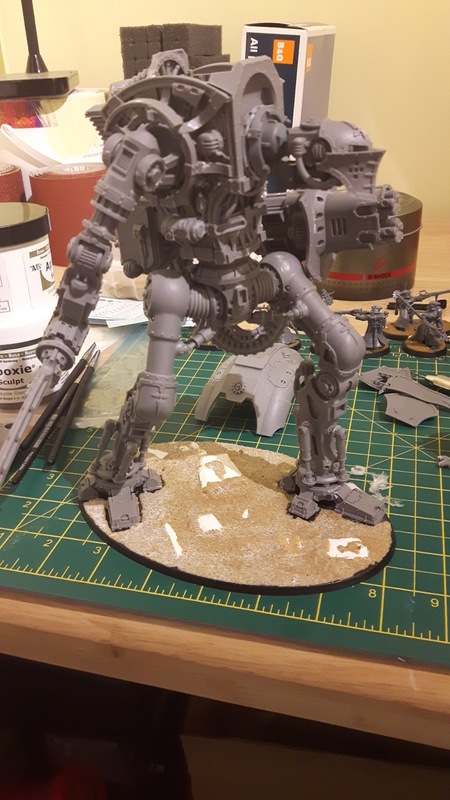 These things retail at £185 from Forgeworld so I would be looking for a substantial discount. In the end, I put in a maximum bid of £60 and was thrilled when the auction ended and I had won at a little over £50. Not bad at all! 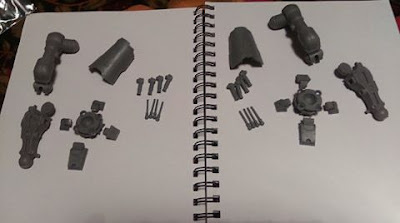 When it turned up, I discovered that it is indeed, a recast (at least judging from my limited experience with such things) and that the neck joint was missing along with one of the exhausts. The main body had been fairly badly assembled using some sort of two part epoxy that was caked into the joints and had set rock hard. It seemed that I would have my work cut out for me, but it was far from unsalvageable. As a brief aside, I am a bit of a fan of salvage projects when it comes to hobbying. I love restoring a miniature that has had a hard life and adding it to one of my armies. I wouldn't want to do it for every model, but once in a while it can be very rewarding. Anyway, having laid out the components and inspected them I cracked on with the build. 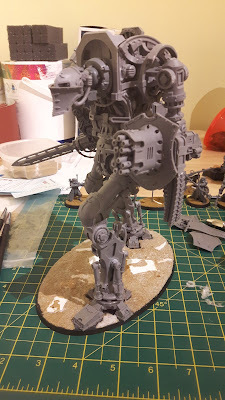 The legs were fairly straightforward, all the components were there and I was able to follow the Forgeworld instructions easily. Other than some minor greenstuff work to repair some casting flaws they came together easily. The main body had already been constructed and I couldn't find an easy way to disassemble it without damaging the components. I trimmed off the worst of the epoxy glue and repaired a few more casting flaws before gluing it to the legs. Replacing the neck joint proved tricky, but I was able to make something out of a rhino cupola and the rear part of a searchlight along with a bit of a Deff dread. I also discovered that the kit had two left shoulder assemblies rather than one left and one right. This was a bit of a head-scratcher, but once I decided what to do, making the components work turned out to be relatively simple. I pinned the right arm in place and attached the head to the torso assembly. I decided to leave all of the armour panels off to make painting easier. 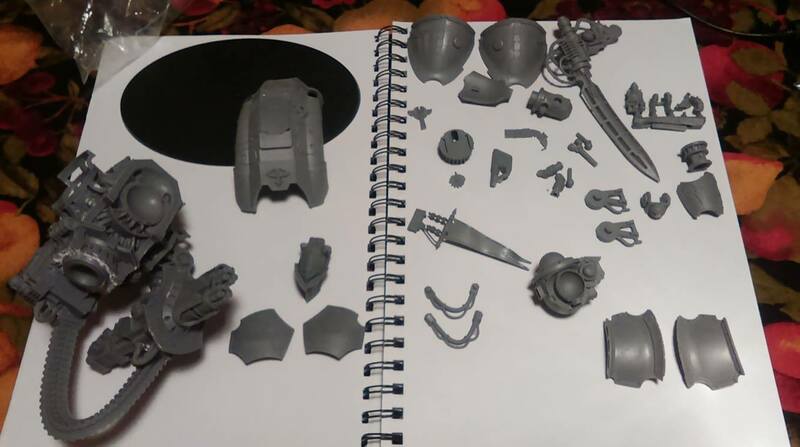 The photos below show the Castigator in its current state. Looks kind of skeletal without the armour. That all brings us up to the state of play with the Castigator. It will certainly be a challenge for me to paint this thing in a month; it's by far the largest model I have ever attempted to paint to completion and it's a pretty detailed kit to boot. Here's hoping the motivation of Monster March will push me through. Tune in next week to see how I'm getting along. What? I don't get personal thanks and mention for graciously supplying the Killa Kan parts? The horror! It is looking pretty good though. I don't think all of the repairs or the fact that it's a recast will show when you're all done. I like to think I paid you in 40k Skaven bitz. I think the searchlight was yours as well! I always loved that class of castigator. Looking forward to seeing what you do with it. I look forward to seeing it finished as well! Certainly seems like a daunting project. Thanks Cylde. I hope it looks great when it's painted! Great post and fantastic model! Thanks a lot for participating again, the first post presenting all participants is on too! Thanks a lot! It is a lovely model, I hope I can do it justice.